That time of year is upon all Primary Choristers out in the world…Primary Program Time! You’re down to the wire to get the kids to polish off those songs, right?! Last year I found this “Get the Bugs Out” Singing Time idea floating around the internet and tweaked it for my primary. It required some prep, but it was worth it. My presidency gave me the entire 40 minutes of Singing Time/Sharing Time a few Sundays before our program for review, and I knew I needed something that would keep their attention for that long amount of time. This definitely did the trick. My primary LOVED it! Step 1: Print out the bug signs. I printed mine on different colored cardstock and glued a magnet to the back so it was easy to put them up on the board and take them down depending on which “bugs” we were working on. Step 2: Make your goo. The size of your containers will determine the amount you’ll need. My containers were quart sized, so I did about 2 cups of goo for each container. You’ll want enough in each container that the kids really have to dig down with their hands to fish out a bug. To make the goo, mix 1 tsp of Metamucil with 1 cup of water in a microwave safe bowl. Add food coloring to obtain your desired color (I made mine green), and microwave the mixture on high for 4-5 minutes. Be careful, it get’s HOT! The longer you microwave, the firmer your goo. Mine was still pretty wet (kind of like not quite set jell-o). To speed this process up, I did several batches at a time. Let your goo cool and sit covered at room temperature until you’re ready to use it. I made mine the night before, so I’m not sure how long it would hold up beyond that time, but I imagine if would be fine if you made it a couple days in advance. Step 3: Add the number of “bugs” to each container that you wish to work on. For example, if I needed the kids to be louder and work on learning the words for a particular song, I would add 2 bugs to my container, one for volume, and one for words. If you’re using gummy worms (which I did, and it was a blast because they were slimy and even more difficult to fish out), I would recommend not putting them in your goo until right before you do the activity. They tend to disintegrate over time. Step 4: Fill a large bowl of water for children to rinse their gooey hands off, and have the towels ready for them to dry off. NOW you’re ready to roll! 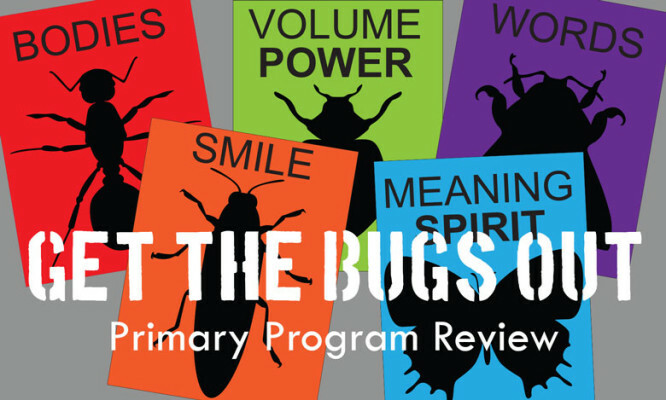 Explain to your primary that you are working on getting the “bugs” out of the songs for the program. Show them your containers, each representing a song they need to work on. Explain that each container contains a few bugs that need to be worked out to really polish up your program songs. Tell the children that if they sing well, and work out all the “bugs” in the songs, they will get to come up and pull out the bugs of the goo. Start with your first song by placing the posters on the board that represent the “bugs” you are working on. As they improve and fix the “bugs” select children to come up and pull a bug out of the goo. When all your “bugs” are gone in that particular song move onto your next song. I tried to make sure I had enough bugs in our songs so that each child who wished to pull a bug out had a turn. Also, at the end of this review, I passed out a gummy worm to each child as an added incentive. It was a huge success in my primary and really helped us get our songs ready for the program! This is just what I needed! I am getting the entire singing/sharing time too. Thanks so much. It’s perfect!